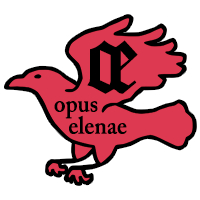 One of the things I believe in is the concept of noblesse oblige as it relates to the SCA and what I perceive to be my duties in it. With my awards and titles comes a responsibility to support my royalty, my kingdom, and my society, and to live up to those accolades. 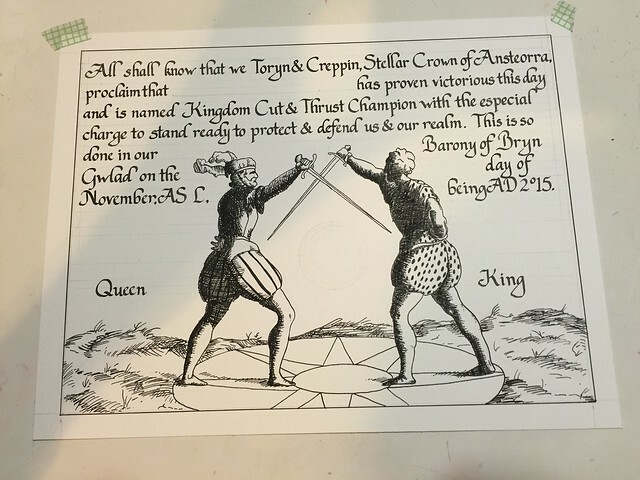 Which is a really self-important way to say that every reign (so about every six months), I try to volunteer my services to make at least one scroll for the kingdom. 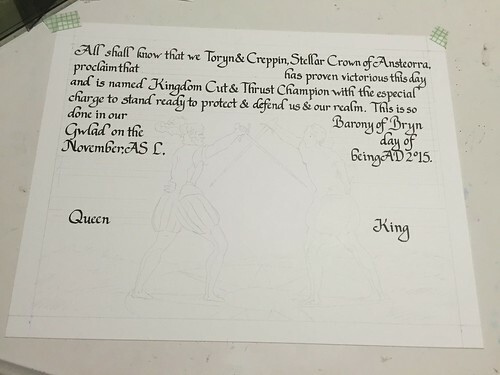 This time around, it was the Cut and Thrust Championship scroll. 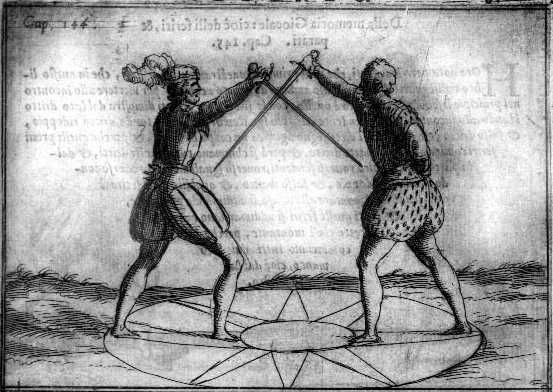 A friend suggested I look at the fencing manual of Achille Marozzo, the Opera Nova. Marozzo was an Italian Master who lived in the latter half of the 1400s, and into the first half of the 1500s. I liked the stark, graphic nature of the copperplate engravings; they’re so different from the illuminations I normally do. I found one plate that caught my eye and decided to run with it. I penciled in the page ditches and figures, with general areas of shadow delineated, and then made the guidelines for the text. The hand is a fancied-up humanist script. 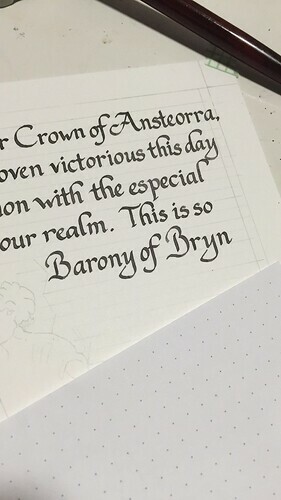 It’s pretty and legible, even if my letterforms aren’t terribly consistent. I obviously need some more practice with it. Look at those Bs! 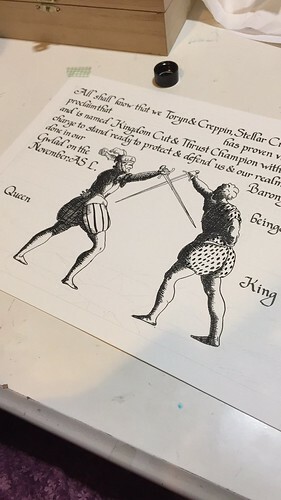 I reproduced the effect of the copperplate engraving with the much simpler technique of pen and ink drawing. It’s been a while since I’fe done any sort of hatching in my drawings, and I was pleasantly surprised at how quickly it came back to me. Here we have Malcolm (as I jokingly named him on the FB page; his hat looks a bit like a Scots bonnet to me) completely finished. 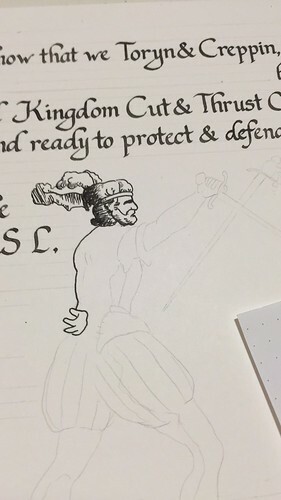 I’m pleased with he depth of shading I got with the hatching. And Malcolm’s friend Kenneth, who has a fantastically developed sartorial sensibility. All ready to head to the event and be given to a worthy fighter! Funny story: my friend Matteo actually won this; it was his first Kingdom-level championship. I’m so proud to have my work hanging on his wall. That looks great! 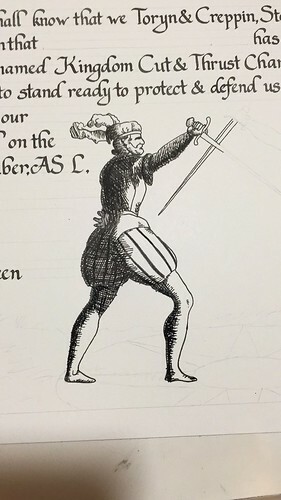 As a fencer (in the East) I always love to see scribes dive into recreating plates.